Illustrated below is the solution to an idealized problem of a linear elastic annulus (blue) subjected to twisting motion caused by rotating the T-bar an angle . The motion is presumed to be applied slowly enough that equilibrium is satisfied. This simple problem is taken to be governed by the equations of equilibrium , along with the plane strain version of Hooke’s law in which Cauchy stress is taken to be linear with respect to the small strain tensor (symmetric part of the displacement gradient). If this system of governing equations is implemented in a code, the code will give you an answer, but it is up to you to decide if that answer is a reasonable approximation to reality. This observation helps to illustrate the distinction between verification (i.e., evidence that the equations are solved correctly) and validation (evidence that physically applicable and physically appropriate equations are being solved). The governing equations always have a correct answer (verification), but that answer might not be very predictive of reality (validation). In what follows, r, , and z are the cylindrical coordinates of the initial position vector. The stated governing equations are almost certainly invalid under large deformations (where both geometric and material nonlinearity are important). Nevertheless, because the stated equations still have a solution when applied under large twist angles, it is still a good idea to run verification tests of your small-deformation code in the large deformation context. Just don’t kid yourself into believing the answer is realistic. The fact that this result holds for any choice of constitutive model can be confirmed using the much more elementary approach of analyzing moment balance for the free body diagram of material falling within the radius r. Finding the other stress components, and finding the relationship between the torque and material motion, requires using the constitutive model. Initial and final position vectors (X and x) on the circle of radius “a” showing that the radial component of the displacement vector (u=x-X) is not zero even though this is circular motion! The deformed position vector of any other point on the annulus may be found by applying a rotation to this solution, where the rotation angle is the polar coordinate angle of the initial particle location. Interestingly, note that the solution for the deformed position is independent of the elastic properties, but that doesn’t mean that the solution is independent of the constitutive model. It is the linearity of Hooke’s law that allowed the elastic constants to fall out. 1. Provide details of the derivation of all of the numbered equations above, being clear to distinguish between equations that introduce a physical assumption from those that follow mathematically from some previously stated physical assumption. For example, what assumptions are made about the stress field to permit the general equilibrium PDEs to reduce to the ODEs in Eqs. (1) and (2)? In making those assumptions about axisymmetry, are you implicitly introducing a constitutive assumption of isotropy? What is the physical rationale behind Eq. (3), etc.? For the torque value, use your personal experience with deformability of rubber. That is, estimate a torque value that you think would be about the right magnitude to achieve the stated twist angle when the annulus is made of a soft rubber. Then check if the computed shear modulus is reasonable in comparison to typical values for the shear modulus of rubber reported in elementary textbooks or websites. 3. Run this problem in a finite element code to see if the code predicts radial motion similar to that in our animation. 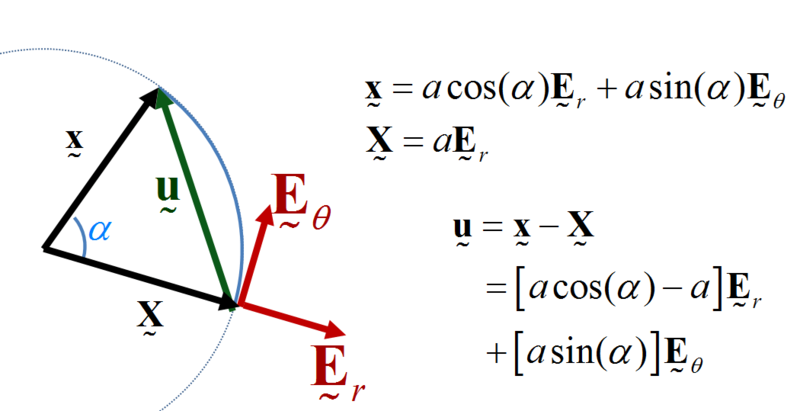 If the code supports an option to account for geometric nonlinearity, run with and without that option (called NLGEOM in Ansys) to explore the effect of that option on the results, especially whether or not there is radial motion. 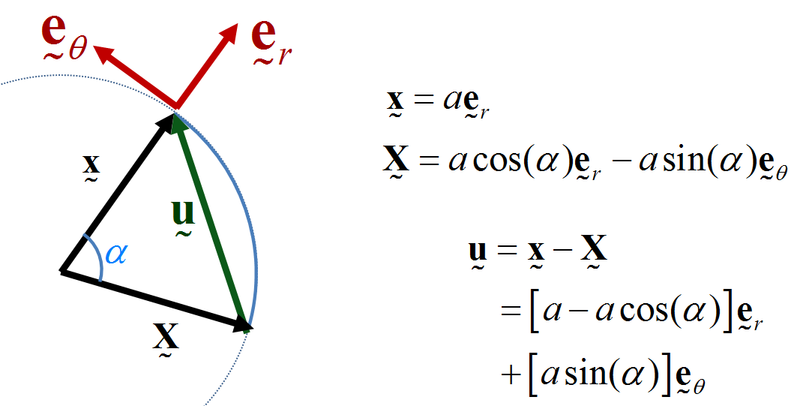 Initial and final position vectors (X and x) on the circle of radius “a,” again showing that the radial component of the displacement vector (u=x-X) is not zero for circular motion even with respect to the current cylindrical basis! VERIFICATION: confirmation that a given set of equations is well-posed (i.e., has a unique solution) and that the solution is found correctly. In this case, we carefully stated the governing equations and solved them to find a unique displacement field. If you run a finite element code that claims to be solving these same equations, then it needs to predict the same result even if the equations themselves are bogus. VALIDATION: confirmation that a given set of equations is physically appropriate for a specific engineering need. In this case, the equations are appropriate to find the shear modulus provided that the the rotation angle is small and that the material being tested really is an isotropic elastic solid. The above equations and boundary conditions become physically inappropriate and quite ambiguous for large rotation angles, as can be shown most compellingly by direct comparison with laboratory data. The above exploration of the sensitivity of answers to changes in the model (e.g., whether the displacement boundary condition is phrased in terms of the reference or current cylindrical basis) is a lightweight form of model uncertainty quantification wherein you are exploring the sensitivity of the results to assumptions in your model. This entry was posted in General Tutorials, Tutorials and tagged constitutive, continuum mechanics, deformation, elasticity, experiment, eye candy, Hooke's Law, kinematics, large deformation, material, mechanics, models, validation, verification. Bookmark the permalink.